An impact wrench is a highly valuable tool in any home. We have all encountered rusty bolts that are difficult to shift or the need to replace a huge number of bolts for an upgrade project. In such cases, there is a better way to tackle such jobs ensuring that we are not left hurt in the process. The answer is definitely an impact wrench. It is a tool that has never met a bolt it could not loosen, and if you are smart enough to invest in an impact wrench, you will wonder how you ever survived without it. On top of the list is a cordless impact wrench due to its ability to take out all the strain involved in different DIY activities. Due to technological advancement in high-end batteries and motor technology, cordless electric wrenches are as incredible as their compressor-powered predecessors are. However, which is the best tool, we hear you cry. 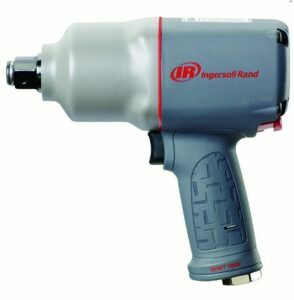 This impact wrench an unrivaled wrench from Ingersoll Rand. The company is one of the best wrench making companies offering market-leading brands to serve customers in global commercial, industrial and residential areas. The company was formed in 1905, and over time, it has perfected the art of perfection that is depicted in its products. In line with the company’s perfection and artistry, they have managed to come up with a wrench that means more power and less air. The wrench does deliver not only outstanding performance, industrial grade durability but also provide efficient air motor efficacy through air consumption reduction that saves a lot of money. The specifications of this impact wrench are top of the line. It has a maximum power of 1350 feet pound maximum reverse torque and weighs at least 7.4 pound and compact enough to fit in tight spaces. It also comes with an air motor that is 16% more efficient than most of its predecessors; it is easy to clean due to the well-placed inlet. Lastly, the product has a 7-vane motor that means more power delivery. The DCF899HB is an impact wrench from Dewalt Company. It is a powerful wrench and efficient when it comes to fastening different items. The 20V MAX VR brushless high torque 1/2″ impact wrench is built for control, speed and working in extremely dark spaces. A majority of the company’s loyal customers and users of the impact wrench have termed it as an incredible item, and a must-have when it comes to loosening bolts in trucks and DIY projects at home. The impact wrench specifications make it a must-have for every activity involving loosening tight bolts. 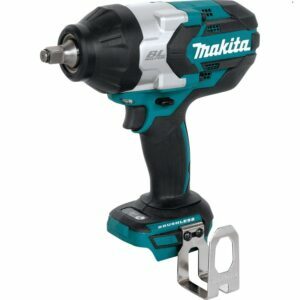 They include a brushless motor to promote superior performance with a tool length of 8.81 inches, a power tool type cordless, a heavy-duty mechanism with max torque of 700 ft./lbs, and a breakaway torque of around 1200 ft./lbs. It also comes with a three-speed selector switch for control, LED work light with no load speed: 400/1200/1900 rpm. Ideally, due to many instances of drop within a work area, this impact wrench is built to withstand a 6 feet drop for durability purposes. Makita XWT11Z 18V LXT Lithium-Ion Brushless Cordless 3-Speed 1/2″ Impact Wrench, Tool Only. 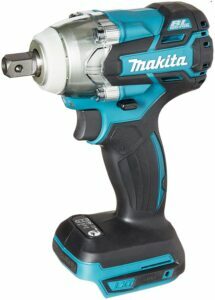 The Japanese company Makita that prides itself in the making of power tools makes this tool. It was founded in 1915 and over the years, it has continuously managed to produce high-end tools that are sold all over the world. The tool does quite a good job and can reach up to 120 ft/lbs even for lug nuts torqued between 70-80 ft/lbs. It is a superb impact wrench and a must have for automotive work especially when one lacks access to a pneumatic impact wrench. It can be used in changing shocks & struts and outperforms other wrenches in removing bolts. Its increased speed and torque make it the ideal impact wrench as it does not over-torque when putting things back together. The impact wrench comes with unique specifications including a BL brushless motor delivering 210 ft. Lbs of max torque. It is also built with a desirable, compact and ergonomic design at 5-3/4” long. It also boasts of a 3-speed power selection switch, a reverse rotation auto-stop mode and an efficient BL brush motor that is electronically controlled for battery optimization. The Makita XWT08Z LXT is a game changer. Going with the specifications, this impact wrench is well priced. It combines 740 ft.lbs of fastening torque and 1180 ft.lbs of breakaway torque with extended run time and speed control for unmatched fastening performance. It features an active Makita brushless motor for longer run time, increased power and speed for longer tool life. Ideally, it is equipped with a switch that offers users precise fastening control. It is ideal for a range of users, from iron and steel workers to pipe filters, railroad and automotive mechanics and forming carpenters among more. The Makita has received enormous positive feedback with most users acknowledging its high torque and efficacy. It is particularly acknowledged by heavy-duty workers who like it because of its slight swivel that ensures that vibrations do not cause any damage to the battery pack. Also, the battery coating gives the instrument an excellent grip without being rough to hold. Generally, the impact wrench is a decent one for its class. 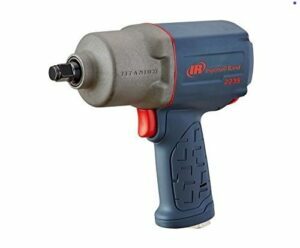 The Ingersoll Rand 2235TiMax air Impact wrench is a standard wrench made by the Ingersoll Company. It comes with standard packaging, the latest sound reduction technology and an extended anvil. For the typical passenger cars and light trucks or all other vehicles, the impact wrench has more than enough power to handle most activities. For its size, the impact gun is light and barely feels heavy. Due to its noise reduction technology, it minimizes noise even without any suppression system. Compared to other wrenches of its kind, it is more powerful to handle the removal of lug nuts. The impact wrench has outstanding specifications. They include 930 feet pounds of maximum reverse torque, nut-busting torque of 1350 feet pounds, finely tuned twin-hummer impact mechanism, a titanium hammer case, steel wear plate, and a composite housing. It weighs approximately 4.63 pounds. The Ingersoll Rand 2135 series inspire its durability. With a yellow color scheme, this impact wrench from DEWALT is an outstanding wrench that you need in your toolbox. 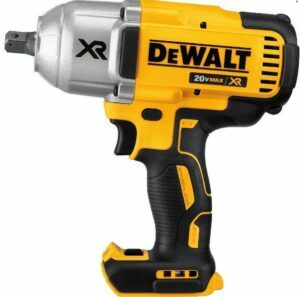 The company DEWALT is known for producing high-performance tools such as corded and cordless drills, saws, hammers grinders, routers, planers, plate joiners and masonry drill bits among others. The impact wrench comes with a brushless motor to offer the user superior performance and a heavy-duty impact mechanism with a maximum torque of 700 ft./lbs. and a breakaway torque of 1,200 ft./lbs. It also comes with a three-speed selector switch for control, LED work light, battery fuel gauge and a battery. The charger is sold separately. The impact wrench is of high performance with a rubberized over mold used to case the handle offering a protective layer against corrosion and impact while making it comfortable to hold. Another reason to get this impact wrench is its anti-burnout technology that protects the motor against anti-overload and the battery against damage. 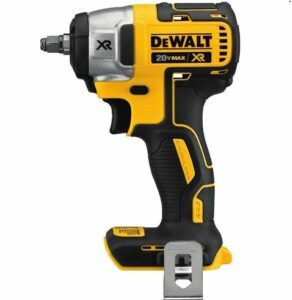 The Dewalt DCF890B 20V Max XR 3/8″ Compact Impact Wrench is a powerful wrench within its class. Critics argue that this impact wrench has an enormous power loss with the 3/8” until compared to its ¼” chuck. Although this might be true, this impact wrench remains undefeatable due to its enormous power despite the size. Another advantage compared to the 1/4” chuck is that it is shorter and can go to places where many cannot. Also, the Dewalt 5 mAh battery charge lasts forever. Anyone who needs to perform brake jobs loosens smaller suspension bolts or anything up to 21mm, this impact wrench does the job incredibly well. The specifications of the wrench are unrivaled. It comes with a brushless motor for efficiency and runtime. A compact and ergonomic wrench with 5.5″ head length and 2 lbs, a variable speed trigger for added control, a cordless power tool type and 3 LED’s providing visibility in dark spaces making the wrench a must-have. The Ryobi Company makes this cordless impact wrench. The company boasts of manufacturing pro-featured tools and outdoor wrenches that are highly affordable for thousands of people across the world. It is an excellent impact wrench if well maintained and removes lug nuts within a short time. One catch not listed in the specification list is that it requires a 4Ah battery to run. The larger the battery, the more the power and the run time. To improve the efficiency of the tool, Ryobi Company got rid of the current battery insertion design to slide in. The slide in battery is more secure and allows more space in the handle to hold electronics. The impact wrench comes with a 3-speed selector that offers ultimate control in fastening and produces a powerful 300 ft.lbs of torque (Max). The tri-LED light increases work area visibility. 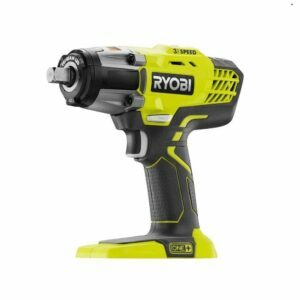 Ideally, one might require a higher capacity Ryobi battery to tighten and loosen nuts and bolts using an impact wrench. This impact wrench is a massive contender for the best cordless impact wrenches. The idea of being the best in its class is arguable until you get to check out the features and the design points that come with the wrench. The sheer power and performance of the wrench is mind-blowing, standing at 1,295 feet pounds (ft-lb) of loosening torque and max. The next specification in line that makes the wrench standout is its ability to produce 1,400 blows per minute making it the most potent hard-hitting twin hammer ½-impact wrench on the market. Other features that might make you consider this impact wrench is the 15% larger rotor that produces enormous power, quiet technology at 86 decibels, and a two-year warranty on parts and labor. As if that is not enough, the impact wrench is sturdy and built to the highest standards in the market. 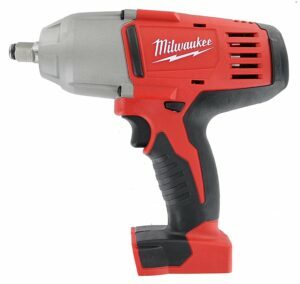 The impact wrench is made by the Milwaukee Company, which is known for making durable and high-performance tools. Ever since its inception in 1924, the company has mastered the art of perfection, and it is reflected in this cordless impact wrench. Although it lacks the torque of its big brother, it has the speed and it is highly efficient. One positive comment offered by many users, is that it exceeds their expectations due to its power. It is an excellent tool for removing lug nuts, easy to use and durable. It is made in China, but its impact mechanism offers the best in class torque at 475 pounds. It is common knowledge that any tool should not be dropped or dragged. In the case of an impact wrench, it is advisable to use the handle when moving it from one place to another. The power should be kept off, and due to durability promotion, the cords should be checked regularly to avoid cases of wear and tear. Any impact wrench with damaged cords is to be replaced or repaired. An impact wrench comes with several accessories. Such accessories are to be protected from harsh climatic conditions including wet conditions, excess heat and the sun. Ideally, ensure that there remain clean and free form debris or dirt. It is important to note that any accumulated dirt can lead to misalignments and jamming parts leading to further damage. In the cleaning process, oil is important as it helps in extending the life of an impact wrench. A poorly lubricated wrench will lead to low power output. An impact wrench is an expensive tool and therefore it is important to keep it well lubricated. The easiest and cheapest way of doing this is installing an in line oil lubricator. The lubricator will ensure that the air tools are receiving oil every time the impact wrench is used. The inline lubricator attaches to the air hose and fills it with the right lubricating oil. It is also essential to conduct routine external lubrication. A properly lubricated and well-maintained impact wrench delivers more torque, lasts longer, runs quieter, and increases productivity. An impact wrench works best when well lubricated. In most cases, it might be difficult to select the best lubricant due to a wide variety. However, it is important that you use the manufacturer’s guide when picking the right lubricant for your impact wrench. Some of the parts to give specific attention to includes the impact apparatus, the vales, and other parts as per the manufacturer’s specifications. In cases where an impact wrench comes with an oil-filled motor, oil should be changed as per instructed. With air compressed impact wrenches, you should ensure proper airflow with regular testing. In most cases, when people use tools such as an impact wrench, they are left lying around. Needless to say, that is a sure way of damaging an impact wrench. Therefore, it is important to properly clean and lubricate an impact wrench as per the manufacturers guide. The surest way of cleaning an impact wrench is pouring tool oil into the inlet and turning on the tool for some time and in the process lubricating all moving parts. Any cleaning agents that contain detergent are to be avoided. The impact wrench should be stored in a dry and enclosed place and any cleaning performed in a well-ventilated room. The worst enemy of an impact wrench is water contamination. A common misconception that exist among many users of the impact wrench is that if one drains the air supply tank within the air compressor of excess water, the wrench is protected against water damage. However, it is important to mention that although draining the air supply tank is good, it only helps in protecting the wrench from rust. Generally, the air outlet is located at the top of a tank and water in the bottom does not make it to the top enough to damage an impact wrench. One common question that exist in the minds of many impact wrenches users is how water gets into airlines and to the air tool. The answer to the question is; condensation. During cold days, water condenses building up in the air hoses and travelling to the air tool. In extremely cold days, water accumulated within the hose might freeze causing more damage to an impact wrench. In most cases, frozen water might block airflow within the air hose. The best way, therefore, to protect an impact wrench from such kind of damage is fixing a water filter in the air hose. The first step is all about assembly. It is crucial to pinpoint that an air impact wrench resembles a traditional old-fashioned drill. It comes with a silver metal body and a trigger release switch that allows the user to exert the right amount of air and torque pressure. 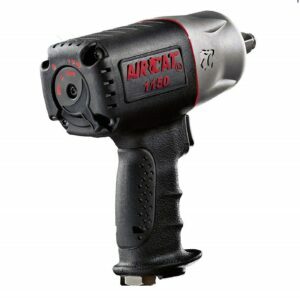 The air impact wrench is joined to a long elastic hose, which is then connected to the gaseous tension unit, which supplies air pressure to the air impact gun. The pressure is possibly discharged when the client applies hand pressure to the trigger. Assembling the impact wrench based on manufacturers guide is important. The hose ought to be joined to the pressure unit first and after that to the wrench. This allows you allowed to detach the wrench from the hose whenever utilizing the quick release clip. The second step is all about testing. After attaching the hose and the wrench to the pressure unit, you should ensure that the unit is exerting the correct amount of pressure for the wrench. The pounds per square inch (PSI) is to be set between 90 to 100 PSI. Afterward, ensure that the hose line is without bends or kinks. Similar to a water hose, kinks will lead to water getting stuck and bulging out under pressure. Air will do the same making it crucial to check for kinks or bends before using an impact wrench. The next step is testing the direction to which the air impact wrench is set by merely light touching the trigger to identify the way it turns. Inside the wrench exists a latch or knob allowing the user to reverse the socket in different directions. In case of loosening it, the knob should be turned counter-clockwise and for tightening, clockwise. The third step is all about speed. It is essential that an impact wrench is set at the right speed. Once sure that the wrench will have the appropriate speed level and torque, then the correct size socket can be attached to the bit at the front of the wrench. The next step should be slipping the socket bit onto the wheel nut and pressing the trigger on the air impact wrench. The nuts of the wheel should loosen easily and taken off. Weight – For short projects, weight is not a huge factor to consider in selecting an impact wrench, however a heavy impact wrench definitely means a lot of work to do in longer projects and that means more fatigue compared to using a lighter one. Therefore, a lighter impact wrench will be easy to control and easier to hold in long projects. Size –Some wrenches are bigger than others. For some projects size isn’t a huge factor, however in tight spaces you will be glad you chose a smaller impact wrench. Impacts Per Minute – This is how many times a hammer strikes an anvil in a minute. A higher number corresponds to a wrench that can drive screws faster.That means the wrench can be able to loosen bolts that are torqued more tightly.